Hi, I am Jonathan E. Turner, Product Marketing Manager for ACQUITY® UPLC® and CORTECS® lines of columns at Waters Corporation. I recently conducted a webinar that talked about the changes we have seen the last 10 years and the substantial improvements in both chromatographic columns and instrumentation that have enabled faster and more efficient separations. The once common 4.6 x 150 mm configuration column packed with 5 µm particles has been gradually replaced by smaller solid-core particles, packed into smaller configuration columns. To maximize the performance of these highly efficient solid-core particles, one must understand the impact that instrument dispersion has on the chromatographic separation. If you missed it, watch the webinar on demand. From your experience, what’s more important, pre-column or post column dispersion? In general, for isocratic separations, both impact chromatographic performance similarly. In particular for gradient separations, post column dispersion tends to have a greater impact. 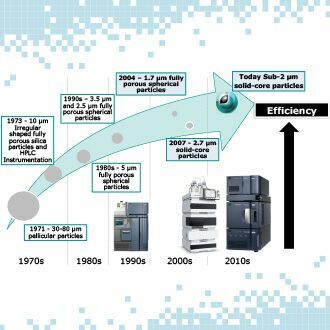 What can be done to minimize system dispersion in an HPLC system? The greatest impact can be achieved using shorter length segments of smaller i.d. tubing pre-column and post column. Selecting an appropriate low volume flow cell will also help. Are low dispersion flow cells more prone to clogging? No, they are not with proper maintenance of your system and good laboratory practices. What is the system dispersion of the ACQUITY Arc UHPLC system? Depending on the instruments configuration, 20-30 µL, when measuring the width of an un-retained peak at 5 sigma. How does the quality of solvents impact performance in HPLC and UPLC ? The most common impact of poor quality solvents leads to background contamination in your detection, particularly in MS. We recommend high quality solvents for all LC separations. Do you recommend using guard column for UPLC system? Yes, we recommend using VanGuard pre-columns for all UPLC columns. What is your experience with pump and injector seals at pressure > 10000 psi? In our labs, we have not observed any issues. We recommend following manufacturers’ recommendation on proper care and routine maintenance. What about large volume (100 µl) of water directly on 2.1mm ID 1,8 µm column? In general, injecting large volumes of any solvent, will lead to poor chromatographic performance. We recommend injecting volumes of <5% of the total column volume. We would also recommend that the sample diluents not be significantly stronger than the mobile phase. What would the optimum flow rate be for a 2.1 x 30 mm, 2.5 µm particle size column on an ACQUITY system? It all depends on the analytes of interest, temperature, mobile phase composition. A good range is 0.3-0.5 ml/min. How does performance of UPLC effect with viscous solvents like IPA compare to routine solvents like acetonitrile? Higher mobile phase viscosities will result in higher overall system pressure. Yes, we sell a full line of SEC products including those for UPLC. For filtering samples, sample adsorption and loss might be problem? Especially when sample volume is small. You can try centrifugation to eliminate particulates in your injection. Or you can use a pre-column filter or a guard column. Watch this webinar on demand. You can also learn more about the Waters LC Portfolio, the new ACQUITY Arc System and the Cortecs columns on Waters’ web site. Also check out our Blog on Simplifying Methods Transfer: Novel Tools for Replicating Your Established Methods.